The Indus River Delta, as seen from space. 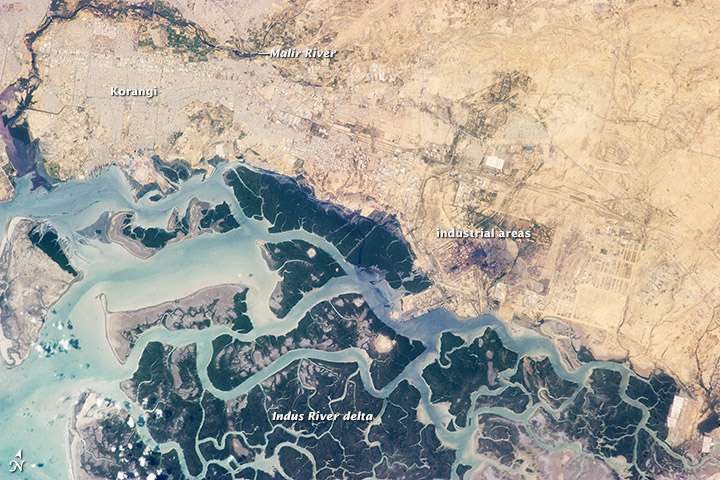 The Indus River Delta (Sindhi: سنڌو ٽِڪور‎), forms where the Indus River flows into the Arabian Sea in Pakistan. The delta covers an area of about 41,440 km² (16,000 square miles), and is approximately 210 km (130 mi) across where it meets the sea. The active part of the delta is 6,000 km2 in area (2,300 sq mi). The climate is arid, the region only receives between 25 and 50 centimetres (9.8 and 19.7 in) of rainfall in a normal year. The delta is home to the largest arid mangrove forests in the world, as well as many birds, fish and the Indus Dolphin. Since the 1940s, the delta has received less water as a result of large-scale irrigation works capturing large amounts of the Indus water before it reaches the delta. The result has been catastrophic for both the environment and the local population. As a result, the 2010 Pakistan floods were considered "good news" for the ecosystem and population of the river delta as they brought much needed fresh water. The population of the active part of the delta was estimated at 900,000 in 2003. Most of the population depends on agriculture and fishing. Mangrove forests provide fuel wood. Many former settlements in the delta have been abandoned as result of lack of water in the Indus and the encroaching Arabian Sea. According to some accounts, the Macedonian fleet (of Alexander the Great) anchored itself for some time in the Indus river delta. It was damaged by a tsunami generated by an earthquake off the Makran Coast in 325 BC. According to Tarikh-i-Hind (also known as the Chach Nama) by 6th century A.D. there existed a port called Debal in what is now the western part of the Indus delta. Debal also seemed to be the base of pirates from the tribe of Nagamara. These pirates' raids against the Umayyads, and the refusal to redress the issue by the ruling prince, precipitated the Muslim conquest around 710 AD (by Muhammad bin Qasim). Debal remained a port, and the last recorded mention of it was in 1223 AD. By the time Ibn Batuta reached the Indus delta, Debal had been abandoned due to increased shoaling preventing the then-port from accessing the sea. During the Abbasids, the caliphate began to disintegrate, and the delta came under the control of the increasingly autonomous province centered at Mansura. The eastern part of the delta was even more independent and controlled by the Sumra tribe until 1053 AD, when the region was brought under the control of the Khilji Delhi Sultanate by Alauddin Khilji. The tribe had several capitals, but none are populated today. In 1333 AD, the Samma Dynasty ruled all of the delta, and established their capital first at Samu-i (on the south bank of Keenjhar Lake) and later at Thatta. It was during this dynasty that the "golden age of native rule" (1461-1509 AD) happened in the delta and Sindh, under the rule of Jam Nizamuddin II. From 1591-1592, the Mughal empire waged a campaign to bring lower Sindh under imperial rule, resulting in the delta coming under the province of Multan and ruled by Mirza Ghazi Beg. In 1739, the region, along with many others, was ceded to Nadir Shah. The Kalhora ruled the region till 1783. The power then transferred to the Talpurs until British invaded in 1843. In 1947, the Indus delta, along with rest of Sindh became a part of Pakistan. The end estimated coastline of the Indus delta with the Arabian Sea (the maximum length in the direction of the coast) is approximated at 210 km (130 mi), 220 km, and 240 km (150 mi). Because the Indus river has switched its location at various points in history, it has an "active" delta region, and total delta region (all area that was once a part of the delta). The total area is estimated at 29,524 km2, 30,000 km2  (11,399 sq mi, 12,000 sq mi) and 41,440 km². The active area is estimated at 4,762 km², and 6,000 km². The length of the total delta along the axis of Indus is estimated at 240 km (150 mi), whereas the current delta stretches from the Arabian Sea to just south of Thatta (~100 km). There are currently 17 major creeks and numerous minor creeks. The delta receives almost all of its water from the Indus river, which has an annual flow of approximately 180 billion cubic metres (240 billion cubic yards), and is accompanied by 400 million tonnes of silt. Since the 1940s, dams, barrages and irrigation works have been constructed on the river Indus. (In fact the World Bank has characterized the works as the "world's largest" and the Indus Basin Irrigation System as the "largest contiguous irrigation system developed over the past 140 years" anywhere in the world.) This has served to reduce the flow of water and by 1994, the annual flow of water into the delta was 43×10^9 m3 (1.5×10^12 cu ft), and annual amount of silt discharged was estimated to be 100 million tonnes (98 million long tons). Since 1994, the water flow has decreased as Punjab has been allocated a higher share of the water. The climate of the delta is described as arid. It receives only 250–500 mm (9.8–19.7 in) of rain in a normal year. Average temperatures for the delta region range from 21-30 °C (70-85 °F) in July, and 10-21 °C (50-70 °F) in January. During the summer, the delta experiences intense monsoonal winds from the southwest, causing parts of the delta to be covered by sea-water. When this water retreats, it leaves behind salts in the delta's soil. During the winter the winds in the delta come from the northeast. The summer monsoonal winds also contribute to high wave energy levels. In fact, the delta is subjected to the highest wave action of any river delta in the world. (The amount of wave energy the Indus delta receives in a single day is greater than that received by the Mississippi River Delta in a year.) Throughout history the delta has survived this wave action because of the large discharge of fresh water to counter the erosional impact of waves. This large amount of wave energy, coupled with lack of silt flowing in from the Indus river (as mentioned above), has resulted in the formation of sand beaches. The Indus river started to form some 50 million years ago. 25 million years ago, the Indus Plain was lifted. Mangrove forests are one of the most abundant ecological communities of the delta, but they have declined over the years. According to Haq et al., they covered an area of 600,000 hectares (1,500,000 acres) until the 1980s and could be found along the entire 240 km coastline, in 40% of the tidal zone, and in 10% of the delta fan. Memon reports that the area of mangrove forests was 263,000 hectares in 1977 and 158,500 ha (392,000 acres) in 1990. Both agree that they were sixth-largest mangrove forests in the world. Previously there had been eight species of mangroves, although only four now remain: Aegiceras corniculatum, Avicennia marina, Ceriops tagal, and Rhizophora mucronata. Among these Avicennia marina constitutes 99% of the mangrove population. As of 2007, the mangroves of the Indus delta are the largest desert climate mangrove forests in the world. Arthrocnemum macrostachyum is also found growing in the delta. 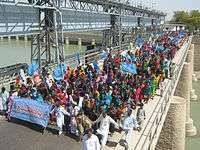 Pakistanis march from March 2nd to March 14th, 2010, calling for the rehabilitation of the Indus river delta. The natural flow of water and fertile sediments from Indus river into the delta has been impeded due to the construction of dams along the river. The reduction of freshwater due to the dams also increases salinity, making the waters of the delta unsuitable for the freshwater species. In case of the Indus dolphin, the damming of the river has isolated the delta dolphin population from those dolphins upstream. The 2010 Pakistan floods were considered "good news" for the ecosystem of the river delta as they brought an excess of much needed fresh water. The Sindh government announced that 8,000 hectares of mangrove forests had been planted, and more plantation was considered (however, the delta has lost 170,000 hectares of mangroves over the past 50 years). The delta faces pollution both from sea and the Indus river. Chemical run-off into the river threatens many species. Most of this chemical run-off consists of agriculture pesticide and fertilizer. The delta faces pollution from the Arabian Sea. Karachi, Pakistan's largest city, releases sewage and discharge from industrial units into the Arabian sea, most of which is untreated. Both Port of Karachi and Port Qasim handle significant shipping traffic, resulting in oil discharge, some of which reaches the delta. All of this pollution lowers the river water quality, causes eutrophication, reducing the amount of habitat. In light of the threats, Indus Delta was designated a Ramsar site on November 5, 2002. The WWF is working is looking into conservation methods to alleviate the Indus delta's shortage of freshwater. The population of the delta was estimated at 900,000 in 2003 (the total population of Indus River Delta-Arabian Sea mangroves was 1.2 million). Within the river delta, about 140,000 (16% of the population) depended on the mangrove forests for their livelihood, and 60% depended on the forests for fuels. At least 75% of the population in the active delta depend on the fishing industry. The population suffers from the lack of health facilities and medical staff. Only about a third of the population has access to clean drinking water. Ethnic groups of lower Sindh can be found in the delta region: Mallaah, Mohano, Soomro, Samma and Jat. All of these groups speak Sindhi and follow Islam. 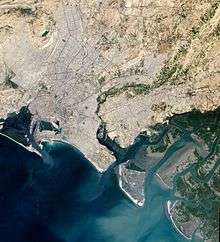 Karachi (centred in the image) is located along the western edge of the Indus River Delta (bottom-right). The delta falls within the districts of Thatta and Badin of the Sindh province. Pakistan's fifth largest city, Hyderabad, lies about 130 miles north of the mouths of the Indus. Towns are found throughout the delta, but there are no large cities on the delta south of Hyderabad. Karachi, Pakistan's largest city, lies west of the delta on the coast of the Arabian Sea. The 2010 floods displaced nearly 1 million people in southern Sindh, including those living in the delta. In spite of this displacement and other destruction caused in the rest of Pakistan, however, many people in the delta considered the floods as "good news". Villagers reported abundance of fresh water for drinking and agriculture. Fishermen reported increase in catches. The economy of the delta consists of agriculture and fishing. As of 2005, more than 140,000 hectares of land were used for agriculture, mostly used to cultivate rice, followed by sugarcane and wheat. Barley, gram, oil seeds, maize, millet, cotton, and jowar are other important crops. Fruits such as coconut, mango, fig, pomegranate, apple, peach, melon, banana, guava and papaya are also reportedly grown. The delta also used to have large pastures for livestock grazing. As of 2003, fishing was an important source of revenue. Catches of mangrove dependent fish were valued at $20 million annually, shrimp at $70 million and mud crabs at $3 million. As a result of resource degradation, a large exodus of people has taken place from the Indus delta. Altaf Memom estimates that 90,000 have been displaced and about 120 villages have been depopulated. One reason give is the shortage of local bushes and plants that are used for preparing various materials (especially by the Jat villagers). Others have migrated due to lack of potable drinking water. The Pakistan Fisherfolk Forum estimates that 14,400 people from the delta coast, majority of them fishermen, are amongst those that have left. Kharochan, until the 1970s was a bustling city in the delta. Its port was used to export locally grown silk, rice and wood. However, rising salinity destroyed the local agriculture and the port was lost to the encroaching Arabian sea by 2006. In 2009, the World Wildlife Fund (WWF) constructed a large water reservoir, of capacity 12,000 litres (2,600 imp gal; 3,200 US gal), in Tippin village (at Keti Bandar) and a few plastic storage tanks (with a capacity of 4,000 litres). It also set up 200-watt solar panels to supply electricity to a school. Finally it installed two 500-watt wind turbines. Electricity was previously unavailable due to high cost of establishing power lines in the difficult-to-access area. In 2010, Sindh Radiant Organization (in partnership with WWF) installed a solar-powered desalination plant developed by the Pakistan Council of Scientific and Industrial Research in the village of Jat Mohammad. The plant is capable of providing 40 gallons of drinking water every day. While the plant is not enough to meet the needs of the entire village, Pakistan's Ministry of Science and other NGOs have shown interest in replicating it to alleviate water shortages in the delta. Research and Development Foundation, a Pakistani NGO, has also started implementing solar desalination in six villages in Thatta with funding from Oxfam. The United Nations Economic and Social Commission for Asia and the Pacific has estimated the potential of generating 100KW of electricity by harnessing the power of tidal currents along 170 km (110 mi) of the delta's coastline. Pakistani fishermen in the delta have increasingly faced detention for accidentally straying over into Indian waters while fishing. Fishermen have been forced to fish near the border as a result of destruction of ecosystems elsewhere in the delta. Because the boundaries between India and Pakistan are poorly demarcated in some areas (e.g. Sir Creek), fishermen often don't know when they've crossed the border. NGOs say that under Indian laws, fisherman can face, at most, three months in prison and a $12 fine. However, most are jailed for a year, and their boats are sold at an auction. Indian fishermen crossing into Pakistan face a similar fate. 1 2 Peter J. Hogarth (2007). The biology of mangroves and seagrasses. Oxford University Press. p. 222. 1 2 3 Walsh, Declan (2010-10-21). "Pakistan floods: The Indus delta". The Guardian. 1 2 3 Walsh, Declan (2010-10-05). "Pakistan's floodwaters welcomed along Indus delta". The Guardian. 1 2 3 4 5 6 7 "INDUS DELTA, PAKISTAN: economic costs of reduction in freshwater flow" (PDF). International Union for Conservation of Nature. May 2003. ↑ George Pararas-Carayannis. "Alexander The Great - Impact Of The 325 Bc Tsunami In The North Arabian Sea Upon His Fleet". ↑ Mahmood Khalid Qamar (2009). "Mangroves of the Active Indus Delta- Changes and their causes". 1 2 3 4 5 6 7 8 Altaf A. Memon (May 14–19, 2005). "Devastation of the Indus River Delta". World Water & Environmental Resources Congress 2005. Anchorage, Alaska: American Society of Civil Engineers. World Wildlife Fund. 1 2 3 Coleman, James M.; Huh, Oscar K.; Braud, DeWitte (2008). "Wetland Loss in World Deltas" (PDF). Journal of Coastal Research. 24: 1–14. doi:10.2112/05-0607.1. ↑ Sarfraz Khan Quresh (March 2005). "Water, Growth and Poverty in Pakistan" (PDF). World Bank. 1 2 3 4 "Indus River Delta". World Wildlife Fund. ↑ Anthony G. Miller; Thomas A. Cope; J. A. Nyberg (1997). Flora of the Arabian Peninsula and Socotra. Edinburgh University Press. p. 253. ↑ "Indus Delta facing threats". Dawn (newspaper). 2003-09-11. ↑ Alex Rodriguez (2010-08-28). "1 million displaced by delta floods in Pakistan". Los Angeles Times. 1 2 Zofeen Ebrahim (2010-06-28). "Water Trickles Back into Village, Thanks to Solar Desalination". Inter Press Service. ↑ "Mighty Indus has its delta ripped". Pakistan Today. 2011-07-09. ↑ Peter Bosshard (2010-06-21). "The Forgotten Downstream Victims of Large Dams". International Rivers. ↑ Zofeen Ebrahim (2009-03-16). "Save the Indus Plead Delta Folk". Inter Press Service. ↑ "Research and development of Solar Desalination Stills for the communities of the Coastal Areas". ↑ Zafar Iqbal Zaidi. 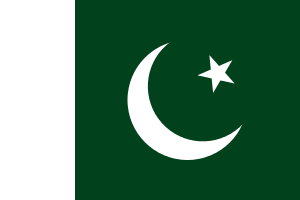 "Pakistan-Renewable Energy Report" (PDF). ↑ Alex Rodriguez (2010-03-09). "Pakistani and Indian fishermen are pawns in governments' disputes". Los Angeles Times. Haig, Malcolm Robert (1894). The Indus Delta country: a memoir, chiefly on its ancient geography and history. K. Paul, Trench, Trübner & Co., ltd.
Haq, Bilal U. (1997). "Regional and Oceanographic, Climatic and Geological Factors in Coastal Zone Planning". Coastal zone management imperative for maritime developing nations. Springer. pp. 55–74. ISBN 978-0-7923-4765-1. Gupta, Avijit, ed. (2008). "The Geographic, Geological and Oceanographic setting of the Indus river". Large Rivers: Geomorphology and Management. John Wiley & Sons. pp. 333–346. ISBN 978-0-470-72371-5. Mimura, Nobuo, ed. (2008). "The State of Environment of the Pakistan Coast". Asia-Pacific coasts and their management: states of environment. Springer. pp. 301–311. ISBN 978-1-4020-3626-2.